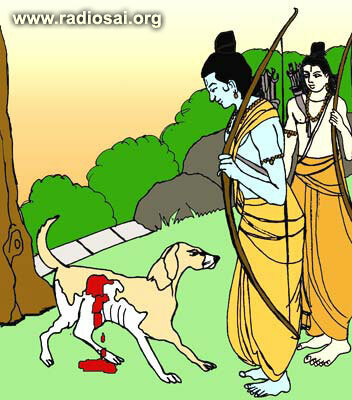 Once, a dog came to Lord Rama bleeding from blows. 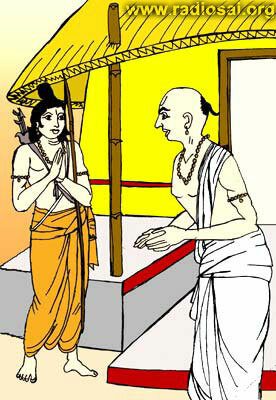 Lakshmana (Rama’s brother) was sent to enquire why it had to receive such blows. The dog said: "I was beaten by a Brahmin (the priestly class in a Hindu society) with a stick." The Brahmin was questioned. He said that the dog was always annoying him by coming across his path. Rama asked the dog: "Well, how do you want to punish the Brahmin?" The dog said: "Make him a manager of a temple." Rama replied with wonder: "That would be a reward, not a punishment." The dog said: "No, I was a manager of a temple in my previous birth. It was impossible not to mishandle or misuse or misappropriate some fraction of God's money. When he is that manager, he too will get, like me, this canine birth and perhaps get beaten too in his subsequent birth." In fact, not only the dog or the Brahmin, but every one of us are lining off the property of God, for does not all this belong to Him? What do we do in return for all benefits we derive from the property of the Lord? We should not simply eat and sit quiet. We have to render service to the poor and the helpless in a manner suitable to us.